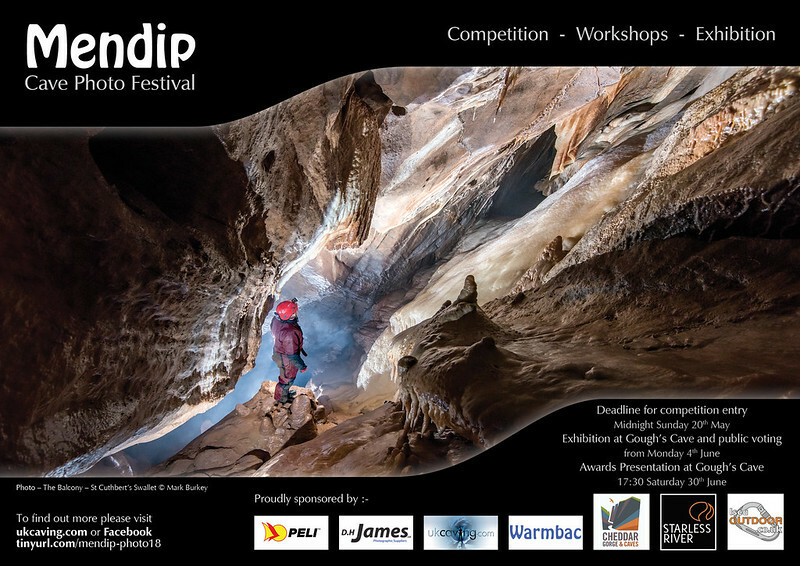 This will be the official thread for the upcoming Mendip Cave Photography Competition. I will post regular updates on here as well as further news. There will be a photographic workshop run during the upcoming cavefest event in the Mendips, hopefully a great opportunity for people to get some shots whilst having a fun and social weekends caving! If anyone would like to attend this please register your interest on this thread. Also there may be a possibility of running workshops in South Wales and/or The Dales. I would be glad to hear from anyone for whom these locations may be of interest. Sorry . It's Peter Glanvill on Facebook ( without the "e" ). I am assuming that the exhibition will run a while. Could the organisers give some thought to promoting caving as a sport/hobby ? Contact details etc etc. Please can the entries be left on dispaly for a longer time? We're not all in Mendip every couple of weeks. I think that is the idea Laurie. There should be lots of Summer visitors to Cheddar Gorge so the Exhibition will be seen by a lot more folk than it ever was at Wells Museum with restricted parking and sometimes unpredictable hours. Perhaps there is too much emphasis on the word " Competition" . ( as per thread header ). That purely stated might put entrants off. I shall put in 5 without the hope of a rosette or gold cup as I hope other less " professional " cave photographers will do. Well done on the two categories organisers. We can have a bit of fun with " People in Caving ". The old TG2 will be firing away between now and then. ( beware ). I think that is the idea Laurie. I shall put in 5 without the hope of a rosette or gold cup as I hope other less " professional " cave photographers will do. I certainly hope a LOT of other photographers will do the same this year. Hello, don't do Facebook soooo a couple of questions: What size should the prints be? Is there a max / min limit? Does it have to be a digital print? I believe digital print is only required if using D H James service to print and mount. Prints should be A4 size with a plain white border for display. Submitted with your prints should be your information and the category entered. A total of 5 prints may be submitted per entrant. Most of the information is on Judi's post above and hopefully Peter will offer other means of contacting him outside of Facebook for those who do not use it. For now any questions on here I'll try to answer and anything I can't I'll try to find out. Thanks, one final question: is hand tinting allowed? Presumably it is as RAW, Photoshop and Lightroom and other computery devices are implicitly allowed as well. OK, another final question: who would one post physical papery stuff to? hopefully Peter will offer other means of contacting him outside of Facebook for those who do not use it. Would there be any provision for a drop off point at Gough's Cave area for prints as Peter goes passed this most Tuesdays ? Have emailed to ask. Will post as soon as I get a reply. Hoping to do something special for the exhibition apart from the five competition entries. You can never have too much Chard. No Chard at all is too much for me. It is the highest town in Somerset you know. Still the Glanvill has a cosy nest on the outskirts. Must rush. Meeting him just after nine as its the Tuesday Diggers day out. Please do not drop prints off at Gough's Cave, (Cheddar Gorge & Caves) as there is no agreed process of how to get them to the organising committee. The discounted price is for the bulk printing of photo's not individual prints. Apologies if anyone misunderstood this. Please do use them yourself but expect to pay the normal prices as displayed. The question from ZombieCake - is hand tinting allowed? Yes as I am sure the digital prints will be 'enhanced' by software either in the camera or separate application. I've been working on mine too.. It looks magnificent!